Though it’s one of the smallest of the Highland Lakes, Inks Lake goes big in many ways. A run-of-the-river lake, Inks Lake covers 831 acres with a maximum depth of 60 feet. Its water fluctuates by about a foot a year. At 4.2 miles long and 3,000 feet wide, it’s the shortest of the first five lakes on the Colorado River chain of Highland Lakes. Perhaps the most well-known place to take a dip — or a leap — is at Devil’s Waterhole. Located at Inks Lake State Park, this deep blue sinkhole is the park’s central attraction. Devil’s Waterhole offers cliff jumping, serene pools for swimming, and waterfalls for exploring. In fact, Inks Lake State Park is a prime adventure spot and home to the only public boat ramp on the lake. The water might be the reason people visit Inks Lake State park, but it’s not the only attraction. You can fish without a license from its shores as well as hike, bike, watch birds, or simply savor the dazzling Texas Hill Country. Hiking trails weave through the granite outcroppings along the banks of the lake with live oaks, cactuses, and mesquite trees creating habitats for a variety of wildlife — the 7½ miles of hiking trails feel distinctly Texan. Rangers invite visitors to fish with them weekly on one of the park’s two piers. You can also follow the Fisherman’s Trail along the shoreline on Inks Lake — a fishing haven. Electric boat rides are available for an extra charge, depending on the weather and the time of the year. You can also paddle around on Inks Lake. Pick up a rental at the state park. Along with canoe, kayak, and paddleboat rentals, the staff holds canoe and kayak programs so you can learn the ins and outs of paddling. You can even go on tours — or a midnight paddle, if you dare. Speaking of midnight, visit the park for one of its Night Sky Parties, held several times a month. The night sky is magnificent here; you can see millions upon millions of stars within the expanse of the Milky Way. In addition to the Night Sky Parties, there are many ranger-led programs held monthly. Take a look at the park events calendar for more. Among the features of the park’s 1,200 acres are 200 lakeside campsites set up for the largest recreational vehicles to rustic campsites. Inks Lake State Park is located at 3630 Park Road 4 West in Burnet. Call (512) 793-2223 for more information. Don’t let the name fool you: There’s more going on at this U.S. Fish and Wildlife Service facility than fish hatching. Inks Dam National Fish Hatchery is actually a one-stop outdoor center. Though raising fish — particularly Clear Creekgambusia, paddlefish, and channel catfish — is a big part of the hatchery’s mission, it also offers plenty of outdoor fun and educational opportunities. You can enjoy a morning of bird-watching in the bird blind or spend a day hiking the many trails, including the Overlook Trail, where Hoover’s Valley unfolds below. Inks Dam National Fish Hatchery runs along Inks Lake and offers a stretch of shoreline for anglers, kayakers, and canoers. You can also enjoy a picnic under the majestic pecan trees. The hatchery is open 365 days a year, including holidays, from 7 a.m.-3:30 p.m. It’s located at 345 Clay Young Road near Burnet just off Park Road 4 between Inks Lake State park and Hoover’s Valley Road. Call (512) 793-2474. 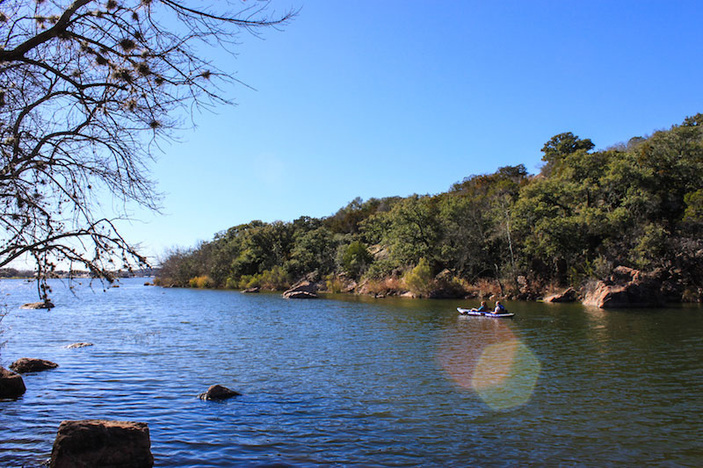 All in all, Inks Lake has a lot for anglers, paddlers, hikers, campers, boaters, stargazers, bird-watchers, swimmers, and more. Spend an afternoon — or an entire weekend — exploring everything this lake has to offer.